There are a certain number of Action RPGs, or Raiding Games, as these are often called, of late on handheld consoles. The numbers continue to grow as well, as games both on the PlayStation Vita and Nintendo 3DS are growing, with the likes of Ragnarok Odyssey Ace, Soul Sacrifice Delta, Final Fantasy Explorers, Monster Hunter Frontier G, and more. The genre of these Raiding games is constantly increasing, day by day. However, this generation was not the beginning of the big craze about Raid-type games on handhelds. The PlayStation Portable can claim that prize, as there were many Raiding games and franchises spawning and going to that system. Such games like Monster Hunter Freedom Unite, Lord of Arcana, and arguably games like Phantasy Star Portable and Phantasy Star Portable 2. These games were experiments with the genre, and some succeeded, with games like Lord of Apocalypse coming to the PlayStation Vita or Monster Hunter 4 coming to the Nintendo 3DS. 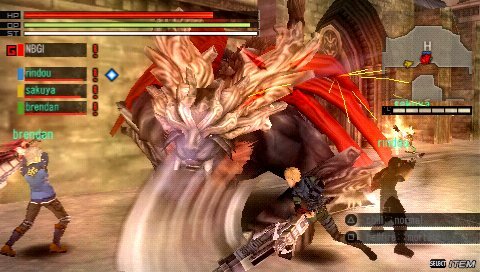 One unique franchise that went past the PSP generation is known as God Eater. This was a very anime-like raiding game that started on the PSP, though changed as the regions changed. When it had originally come over to the West, features were added and the name was changed, much like in games like Ragnarok Odyssey Ace and Soul Sacrifice Delta. Having made a name for itself for a Vita sequel in Japan, here is our official review of God Eater Burst (though called in the West as Gods Eater Burst). The story of God Eater takes place in a futuristic version of a post-apocalyptic Japan. In this world, creatures known as “Aragami” appeared in the world, slowly growing in numbers and have nearly decimated the human race. What is left of the human species are spent in hidden towns and cities, or in military branches under the name of Fenrir, aimed to defend and exterminate Aragami to prevent them from completely wiping out the human race, using weapons known as God Arcs and the warrior titles of God Eaters. The story revolves around you, the Main Character, whom is a “New Type” God Eater, whom can actively switch and be proficient in both Blade and Gun weapons types, as opposed to “Old Types” whom are proficient in only one of the two. You join the East Branch of Fenrir to help fight off the coming Aragami, along with fellow New Type, Alisa, moving into events that bring your commanding officer to go missing and for you to run search hunts after him, uncovering secrets behind the Aragami, themselves, and many projects that the human species is working on. The story of God Eater is unique when compared to other raiding games because it is cinematic and progressing throughout the entire game. While many raiding games, like Ragnarok Odyssey, don’t have a story other than “Go kill that. Now go kill that. Now go collect this so I can make weapons to kill that”, God Eater has a bit more to it. All of its scenes are 3D cinematic and each character has much character development that you learn about the more you play, particularly your fellow New-Type, Alisa. God Eater Burst is, like other games of the genre, a mission-based raiding game. As you progress through the story, you will be spending much of your time at your home base as well as taking on missions that take you to various places of the world to seek and annihilate Aragami in that area, be it smaller monsters or coming together to fight one large monster. You will be spending a lot of time out in the field and fighting off Aragami with your comrades in an attempt to unlock more missions and advance the story. When you’re at your base, you will have many places to go, such as various floors to talk with other characters, as well as your own room, where you can customize your character’s looks, save the game, or access a Terminal that allows you to learn more about the world as well as buying and crafting weapons and equipment to use in your missions. Apart from these areas, there is also a vendor from which you may collect and buy usable items in the field, be it stun grenades, healing items, traps, and more. Other than NPC’s wandering around the area, there is also the secretary you can talk with to accept missions from various “Difficulty” chapters for the story. There will be story missions, but you will also need to complete the other “Free” missions to unlock more Story missions. Actually going out into the field and fighting is another way God Eater is unique. Many raiding games do not allow you to take other people with you, unless you’re using the Multiplayer features of the game. While God Eater Burst does, indeed, have multiplayer features for Ad Hoc, when you go on a mission, you have a fairly lengthy list of NPC’s that you can take with you, with a maximum of a four-member party. Once you get past the first couple story missions, nearly every mission will consist of you and three others taking on the Aragami. Once in a mission, you will be in a large area, full of platforms, buildings, and other landscapes with the goal of finding the target Aragami and wiping them out. You can do this by running, jumping, and attacking various enemies. When you are in a mission, you will have your own weapon equipped, which begins as a sword, but can be transformed by a simple button tap into its gun form, which resembles a large chain gun, though doesn’t always fire like one. These are both very useful and essential for taking down the enemies. When in Blade Form, you can use two types of attacks, a normal attack and a heavy attack. Normal attacks are much quicker, yet weaker hits, and the Heavy attacks take longer to perform but deal a lot more damage. When in Gun form, though, it’s trickier. 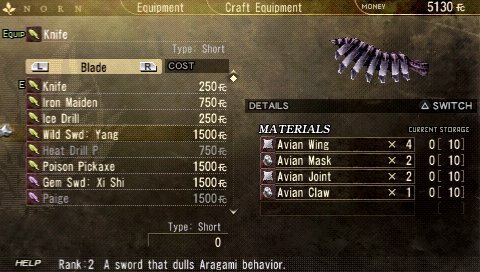 You will have at least a dozen different types of bullets and mortars that you can use, and each is elemental, making use of each different Aragami’s elemental weakness. You also only have a certain amount of “Bullet Energy” when in gun form, so if you run out, you’ll have to switch to your Blade until it recharges. The key to taking down Aragami is to know what they’re weak against and to learn how they attack, so you may maneuver and wipe them out with taking as little damage as possible. To make this possible, you have to watch what happens when your attacks hit. Aragami have weak points on parts of their body as well as elemental weaknesses. If you hit only makes sparks when it hits, you didn’t do much damage, but if it causes a large red or green explosion, it means you did a lot more damage. The final parts of fighting will be Devouring and Burst Mode. If the title was any indication, your God Arcs can turn into a Predator form, where it forms organic teeth and can literally eat the enemy. If you are able to charge and successfully eat an enemy that is still conscious, you will obtain a temporary special bullet ability as well as Burst Mode, where all of your abilities will do much more damage for a short amount of time. You can also devour a fallen enemy to collect items from them, in order to craft new weapons and armor. Getting knocked out is another very convenient part of God Eater Burst. When your HP reaches 0, you don’t get a Game Over. You will lie unconscious until an ally comes over to revive you. While this is limited to 2 or 3 times in some raiding games, this is practically limitless in this game. So long there is at least one of the four party members conscious and able to revive people, the mission will not end. There was one time where I got knocked out at least 12 times and still managed to get revived and finish the mission. Once the mission is over, you will save and return to your base. It’s important to collect materials in every mission because of crafting and upgrading your weapons. Unlike other raiding games, each different weapon upgrade handles differently. If you upgrade your Blade weapon to a more powerful model, it could attack slower or have more hits or range for each hit that it does, and the Gun may fire slower, more powerful shots when upgraded. 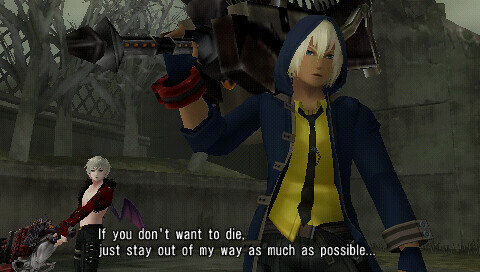 In essence, each mission of God Eater Burst is going to be a “Go kill this” mission. While this sounds like it would get repetitive over time, the regular story scenes as well as learning to handle new and more powerful weapons helps to balance that out. As far as length goes, though, God Eater Burst should last you about 30-35 hours to complete the story. This is actually a bit longer than some of the more recent raiding games, like Ragnarok Odyssey. Controls in God Eater Burst are quite heavy in buttons, though they flow together well, especially when played on the PlayStation Vita. The game’s field controls will utilize almost every button on the system, including the start and select buttons. You may also re-map some controls to the touch screen, since this is a PSP game. Moving your character around the map is done with the Left Analog Stick and the D-Pad handles the camera controls, which can be mapped to the Right Analog Stick for a much more comfortable experience. The X Button will allow your character to jump in the air to begin aerial combat as well as confirming options in a non-battlefield menu. The Square Button handles normal attacks for both the Blade and Gun weapons, and the Triangle handles the heavy attacks for those weapons as well as being held to go into Predator Mode. The circle is also used for rolling and dodging incoming attacks, which can be done with a weapon out and firing. The L button is used to lock onto a target and the Select Button is used to bring up your inventory to use an item to help you out or stun your enemy. The controls can seem a little intimidating at first, but once you play for a bit, they easily get thrown into your memory. The only awkward part about the controls were using the D-Pad to move the camera, which is remedied into a very comfortable situation on the PS Vita. When playing on the PlayStation TV, the controls are the same, but with the addition of the R2 and L2 buttons. These buttons function the same as the L and R buttons with locking onto targets and changing your weapon type. It works well on the DS3/DS4 controllers. 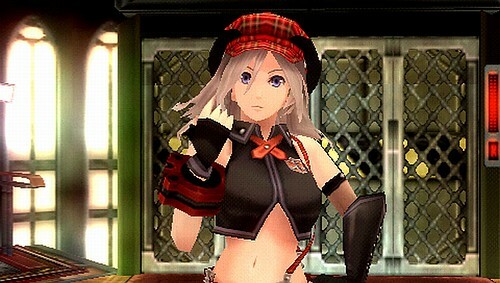 The visuals for God Eater Burst were good for a PSP game, but not great. They were completely 3D, even the story scenes, but it wasn’t on par with other games, like Dissidia and Metal Gear Solid: Peace Walker. This is much more apparent when playing the game on the PlayStation Vita’s larger screen. As the screen stretched, more and more jagged edges around the character models appeared. Granted, it doesn’t look bad, but it doesn’t look great, either. This goes the same for the PlayStation TV. It looks the same as on the Vita. The environments look nice, but there are a lot of jagged edges around the character models. As far as how the game plays, it’s decent. Load Times are fairly lengthy, but can be gotten used to. When heading out for a mission, it took me an average of about 10-12 seconds to load the mission to where I could start moving around and fighting. While this isn’t unacceptable, it’s a great deal longer than the load times for games like Ragnarok Odyssey Ace, which only takes about 4-5 seconds to load a mission. Otherwise, the game plays without issue. I experienced no lag or slowdown when fighting enemies on the maps, nor did I experience it in scenes. The game plays well, if you are okay with the jagged edges and lengthy load times. 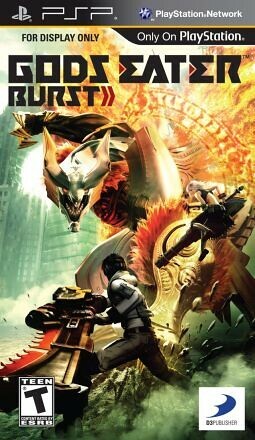 God Eater Burst is a unique game in the growing list of Raiding style of Action RPG’s that are coming onto the market. While the missions can get repetitive, the presentation took a hit when displayed on the Vita, and the load times are fairly lengthy, it has a good emphasis on story, brought some fresh things to the table and, at times, can prove to be much more fun to play than the more recent games like Soul Sacrifice and Ragnarok Odyssey.